Even though Microsoft Exchange Server 2010 has already been released, many organizations still use Exchange 2003. In this article I’ll explain how to thoroughly monitor the various Internet protocols that Exchange 2003 offers, including SMTP, POP3, IMAP (and NNTP for that matter). The reason why I’ll only be looking at Exchange 2003 is because there is a significant difference in architecture between Exchange 2003 and later versions. It is a common misconception that you can effectively monitor the W3SVC service (commonly referred to as IIS, though IIS encompasses a lot more than just a web server) and other services provided through IIS, such as SMTP and POP3, by simply monitoring their associated service. It’s a misconception, because a given IIS-based service may contain multiple instances – most commonly the case with the World Wide Web Service which often hosts multiple independent web sites. The status of these instances can be controlled independently of the hosting service, though that service needs to be running of course. Don’t despair though, most server-based windows applications, fortunately, can be monitored by ensuring that their respective service is – well – running. For example, to ensure that the Apache service is up, you “simply” make sure that the Apache service is running. The same goes for countless other services such as MySQL – even SQL Server (of course you can still detach individual databases in SQL Server). Exchange 2003, due its partnership with the Internet Information Services 6.0, is different though. Yes, IIS and Exchange 2003 are tightly coupled, and if you intend to have your Exchange Server 2003 communicate with any other server using a standard Internet protocol such as SMTP, then you will need IIS. The screenshot above shows that the inetinfo.exe process hosts all the major services (bold name), and that each service can host one or more instance. For more details please see http://technet.microsoft.com/en-us/library/bb124674(EXCHG.65).aspx. 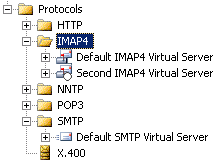 As you can see, IMAP4Svc, POP3Svc and SMTPSvc all use inetinfo.exe (Executable column) for their host process. So why is this important again? Since all of these services support multiple instances INSIDE the service (inetinfo.exe), the host process will continue to run even when one or more instances inside the service are stopped. Since most installations only have one instance, stopping that one instance inside the service will still leave the service up and running. The effect of course is the same; the service is not available to the end users while the Windows service will happily continue to run. So I think we’re all in agreement now that monitoring the POP3, SMTP etc. services in Exchange 2003 is not enough if you want to ensure that these services are actually available. So how do we monitor all of these instances? The easiest way is actually with a VBScript, which is included below. VBScript works well since the cscript.exe interpreter is readily installed on Windows 2003, so no additional installation of tools is required. The script enumerates all instances of a given protocol, and checks whether they are running or not. If at least one instance is not running, the tool will return 1, thus setting the ERRORLEVEL to 1. 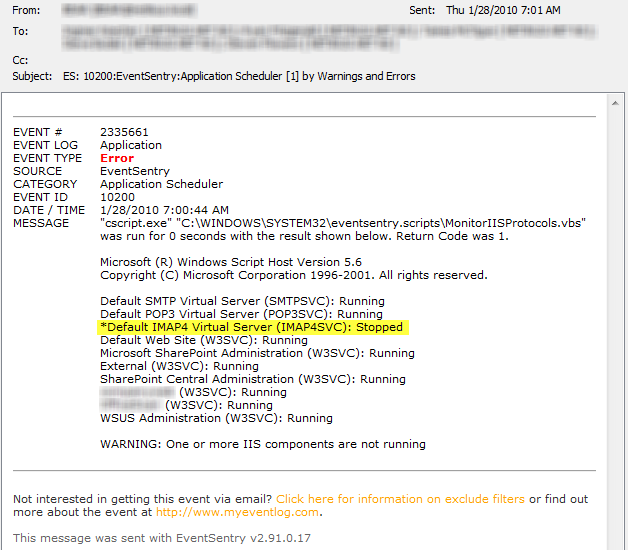 This VBScript can then be embedded into EventSentry, which will then run the script at set intervals using the application scheduler, notifying you via email (with the proper filter setup) when an instance is stopped. There’s a screencast for that, you can view it at https://www.eventsentry.com/screencasts/eventsentry-application-scheduler/eventsentry-application-scheduler.htm. It shows you how to create an embedded script and setup EventSentry to notify you when the scripts returns an error. Note that the screencast uses an older version of the script which only monitored web sites (not SMTP, IMAP4, …), but the process of setting up the script with EventSentry is exactly the same. after line 102. This will still trigger an email (or error) to notify you that it was stopped, but a subsequent run of the script at the next monitoring interval should not trigger an error again if the start was successful. A note of caution here though – I have seen the script hang indefinitely with this line added when an instance that is currently stopped can’t be started because it’s not configured correctly. Hence, it’s not included by default. You can also download the script from here.